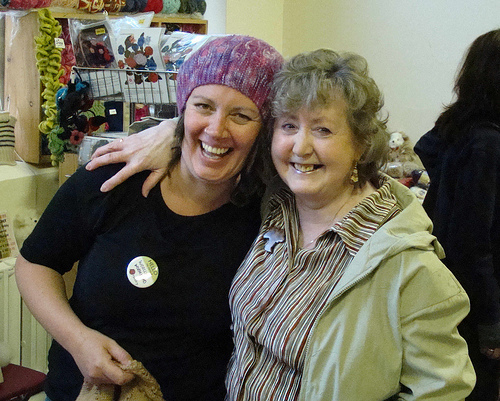 The 6th June saw me in Coventry for UK Ravelry Day. So much happened, I saw so many people and fondles so many Hats and skeins of yarn, that it's impossible to mention everything but I'll give it a try! 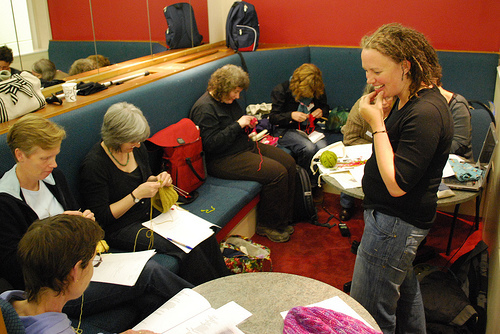 Fibre folk were in abundance - the place was packed! Not just knitters or spinners or dyers or crocheters, but also magazine editors and staff, publishers, designers and teachers. There were people from all walks of the industry, and that's something I love to see; everyone mingling and enjoying our common interests. The Kitchener Workshop was a success, despite a few hiccups. It was great to teach it again, and remember all the reasons why I absolutely love it - Kitchener is a very logical process, and I'm pretty sure the students got that aspect too. We managed to cover quite a bit, and lots of notes were taken! I was wearing my Marina Hat most of the day, though took it off during the workshop as it's a good example of garter stitch kitchener. On the yarn front, I was very restrained. I came home with (left to right): Manos del Uraguay Silk Blend (70% Extrafine Merino, 30% silk), Natural dye Studio Dazzle BFL DK (100% BlueFaced Leicester), Fyberspates Scrumptious 4ply (55% Merino, 45% Silk). These are all very yummy and one of them has already become a design, which I need to try and get finished today. I've been moving towards semi-solids and solids lately, mostly because the next run of designs will be quite textured. MrsFlowerpot also gifted me some of own hand-dyed, as she's been experimenting with lengths of colour and dye to avoid pooling and self strip in different widths. Thank you! I talked with editors and yarnies and marketing folk and publishers and suddenly my life has got busier - lots of new designs on the horizon! I have no idea how I'm going to manage it all, but we are planning our trip back to the UK, so with any luck the reduced heat and bonus of grandparents might mean I'll get some work done.